SuperBetter is powered by the science of positive emotion and social connection. Every mission in the game is directly inspired by leading-edge research in psychology, neuroscience and medicine — research that helps us understand how we can increase our ability to become stronger and more successful in the face of challenges and the pursuit of our goals. One especially cool aspect of the game is the idea of “Power-Ups”. They’re the real-life version of those little glowing spheres a video character can collect in order to restore health or energy in a video game, activities or items that re-energize, inspire, soothe, or otherwise make your life better. These are different from rewards. They’re intended to improve your “positivity ratio”, because research shows that positivity has numerous benefits, including increased creativity and decreased anxiety. What can I say? I have a one-track mind, and when I find nifty tools for self-improvement, I like to think about how it might be applied to my writing life. 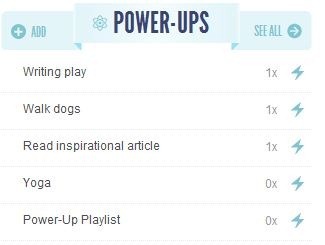 This idea of “power-ups” is a great addition to the writer’s toolbox. They can be used fuel creativity, counter negative self-talk, energize, inspire—basically, to inject some positive into the day-to-day of being a writer. 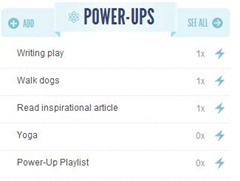 Please add your power-up ideas in the comments and I’ll add them to the list! *For more information about SuperBetter, its creator, and the science behind it, check out Gamer Heal Thyself With Jane McGonigal’s SuperBetter. SuperBetter?? I’m in! I have a list similar to yours, Cheryl. I like to do Sudoku puzzles and find-a-word puzzles, so I would add those to the list. I don’t always take the time to do them! Hi Jessica, please, shameless plugs for great programs are always appreciated! I’ve found the SuperBetter program to be extremely motivating both for health and writing :). Thanks for stopping by!